Austin ISD Is Going To Close Or Consolidate Some Schools. Here's How The District's Going To Do It. Facing a major budget shortfall and declining enrollment, the Austin Independent School District says it's working on a plan to close or consolidate schools that could be finalized as soon as this summer. AISD Superintendent Paul Cruz says the school board will lay out the plan during its work session Monday night. He says no specific schools – or any specific number of schools – have been considered under the plan, though historically under-enrolled schools are first up for district review. The review begins by looking at whether a school's population is expected to continue declining, whether a school's boundary are could be adjusted, and whether a school is near another campus with which it could be consolidated. 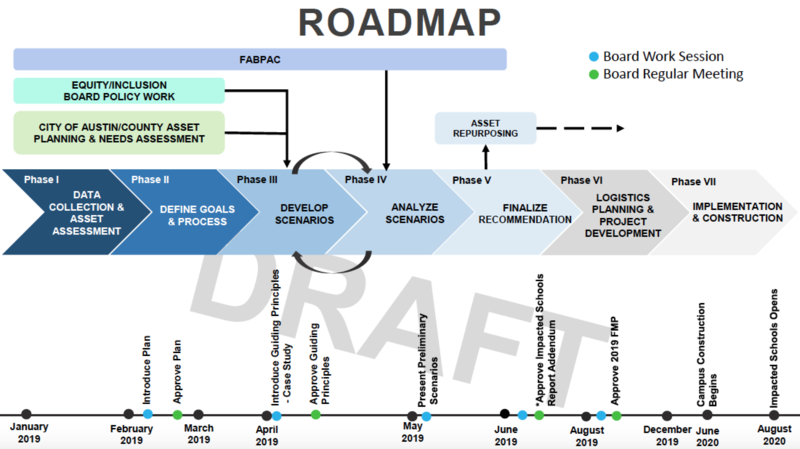 A timeline of the district's Facility Master Plan. The district will also consider other factors in a consideration, including a facility's condition or operating costs and whether closing or consolidating a campus would be burdensome for commuting families. Cruz was quick to point out this plan isn’t just about whether to close schools. He says the overall goal is get as many students as possible into modern and updated schools. The district's Chief Officer for School Leadership Michelle Cavazos said the plan would also look at how special programing like dual-language courses, STEM classes and early college high schools could be spread throughout the district. Read more on the district's evaluation process for consolidation or closure here. "[It's about] providing kids access and opportunity to access these things as close to home within their neighborhoods as much as possible," said. The timeline on all these changes is relatively quick and, Cruz noted, is likely to change. Ideally, Cruz said, he'd like to see the AISD board approve the plan to evaluate school-use before the end of February. Then there will be three months of discussion among the Austin School Board, district officials and the community of which schools will be affected by this plan. The district plans on finalizing the closures, consolidations, programming changes and repurposing of facilities this August. District administration first brought up the idea of school closings and consolidation in December, when they sent a document to the school board saying they wanted close 12 schools. Many people have pushed back at the idea of consolidating schools in East Austin, where many black and Latino families live, saying it adds to inequity in the district. The suggestion for closings and consolidations also came from the Budget Stabilization Taskforce, a group of educators and community members the district asked to review the budget. Why Didn't Austin ISD Cancel Class At Bailey Middle School After Flu Outbreak? This flu season is hitting schools in Central Texas extra hard. The Lago Vista Independent School District canceled classes for the rest of this week because of an outbreak, and McDade canceled classes last week for the same reason. A 15-year-old student is in custody and faces a felony charge following a report that a person had a gun on campus at Lanier High School, Austin ISD Police Chief Ashley Gonzalez said. A groundbreaking ceremony was held Saturday on the new site of Eastside Memorial High School in East Austin. The high school will be located in the former L.C. Anderson High School, which closed in 1971 after a judge desegregated Austin schools.